Pizza is controversial. Don’t believe me? Ask your friends, on a platform like Facebook, if they think pizza crust should be thin or thick. And if you really want to stir the marinara, ask if they think pizza should be folded when eaten. I love green olives on my pizza. Some people say this makes me a ridiculous person but I don’t care. Yum. Meet Justin Vogel. He and business partner Mark Eskow know pizza. Eskow hails from New Jersey where babies are born with a folded slice in their hand. Justin and Mike wanted to open a restaurant and were both sure that it should be a pizza joint. After all, pizza is their favorite food and they know the subject well. Justin Vogel stands in front of his pizza restaurant in downtown Greeley, Colorado. The two men researched their way through hundreds of pies all across the country during their work in oil and gas. They also had a pizza oven in their apartment so when they weren’t eating pizza they were making pizza (and then eating their creations). Their passion turned into Right Coast Pizza. 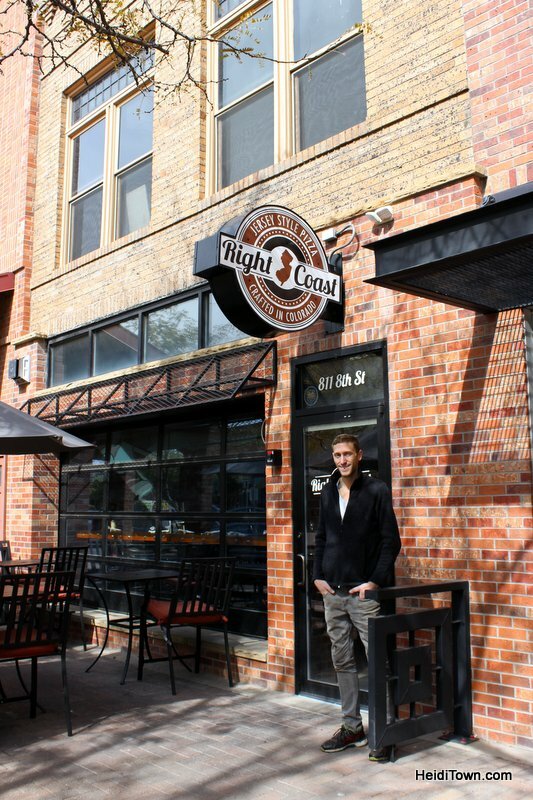 In 2012, the first Right Coast Pizza opened in Wheat Ridge, Colorado, where Mike now holds the reins. The rest, as they say, is history. Even though a second store wasn’t in the plan, Right Coast Pizza opened in Greeley’s downtown on July 4, 2015. 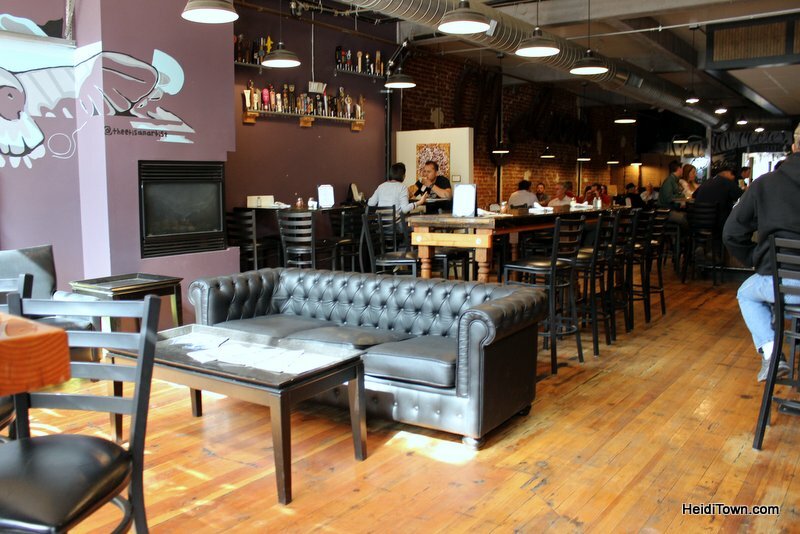 At Right Coast Pizza guests can carry out a pie, but the comfy ambiance and 31 beers on tap may entice them to sit down for a meal. In fact, this Greeley restaurant features lunch specials and that makes it popular around noon. There aren’t any heat lamps keeping oily pies warm here. 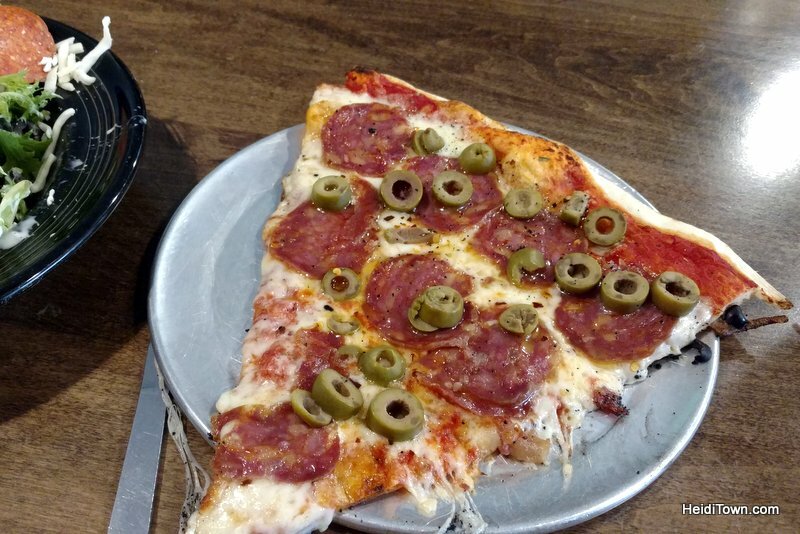 In fact, even the slices are made on the spot, which means you may wait two or three minutes longer, but a fresh slice of pizza is worth it. In addition, they source locally even when it comes to things they need to be done around the restaurant. “It’s important that even when I need a tradesperson for home or for the store, that person is from Greeley and usually a customer,” says Justin, who lives three minutes from the restaurant. 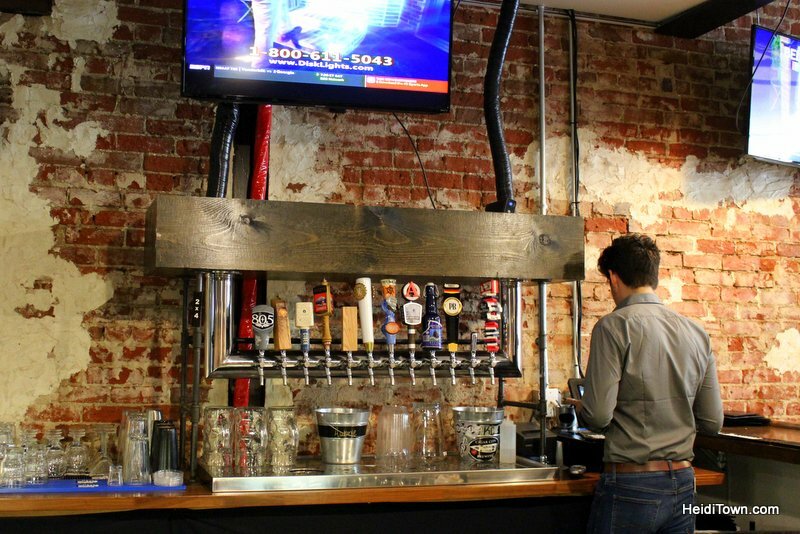 Justin’s love for Greeley is palpable, and he wants everyone who lives in the vicinity to realize what downtown offers. “It provides everything from an independent movie theater with a speakeasy downstairs to family-friendly festivals like Friday Fest,” he says. This Greeley pizza restaurant has gone way beyond the East Coast’s love of simple, cheese pizza. Justin created a pizza featuring pulled pork, barbecue sauce, and pineapple and it has become a customer favorite. 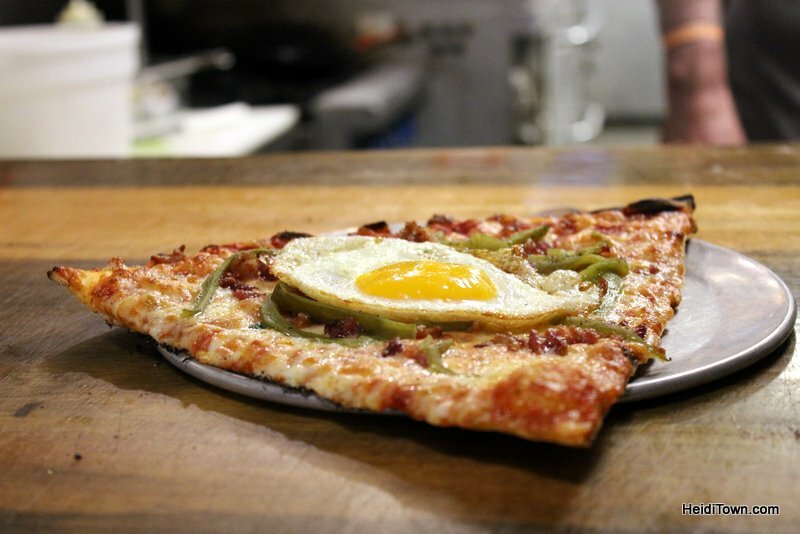 Right Coast Pizza even has a specialty pizza with bacon, green chilis and an egg on top—all my favorite things on one pizza. An egg on a pizza? Yes, please! The reaction from Greeley, which has swelled to a population of more than 100,000, has been positive. In fact, in response to a “favorite pizza” question I posted on HeidiTown’s Facebook page, Right Coast Pizza was mentioned several times. “We are a pizza restaurant and we decided early on at Right Coast Pizza to do what we do best and that’s making great pizza,” says Justin. 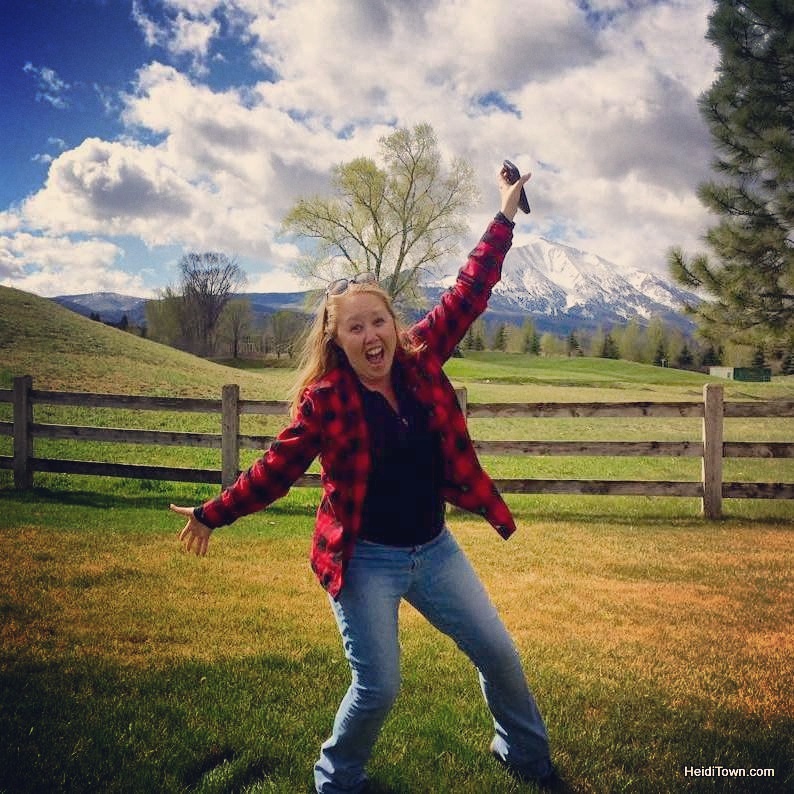 It’s a great motto for life—do what you do best and support others who are doing what they do best. That being said, I can attest, from personal experience, that Right Coast Pizza is very good at making great pizza. This post was brought to you by First National Bank of Omaha as part of their We Grow As One campaign.